If you believe that the only way you're out of luck with the size of the hall, you are deeply mistaken. There are many people with this situation, so, let's solve problems together. However, if you are a comfort, then the holders of a very large halls, too, sadly. After this huge nowhere adaptable area often requires much more attention than the same room or office. After all types of furniture for the hall not so much: wardrobe yes ottoman. Oh, and every accessory detail. And it turns out that this area and nothing to fill. Believe me, people in a small hallway and great taste can create an interior lot more interesting than when trying to arrange a large hallway with no taste. What tricks will help you in the struggle to square centimeters? If you are at the stage of repair, you should look more closely, some planning can quite successfully to extend the area of the corridor, although sometimes at the expense of a piece of the room. If the repair is already far behind, or redevelopment is not possible for objective reasons, here you need a flight of creativity. The most important thing to remember when settling any small space - this is minimalism that is as small as possible all sorts of details. In particular, it concerns all the favorite mistresses "decorations": podstavochki, candles, vases, various amulets and useless attributes. Hanging them in the hope of giving beauty backfire: your tiny hallway looks cluttered, even if all the accessories just out of the store. For the same reason, avoid open racks, dump you feel assured. If you still a supporter of such items, place them in the depths of the hall, so they come across on the eye and do not attract attention. Avoid bulky furniture, cabinets, choose a depth of 45cm. This will allow you to win extra 15 cm Believe me, 45 cm is enough to accommodate several pieces of outerwear in the frontal plane. Precautions should also use bright accents. Vivid color spots require sterile clean with no signs of human activity, as in films by Stanley Kubrick. But if your home is more like "Solaris" by Tarkovsky, where human traces are everywhere, like a cobweb and fallen leaves in the corners of the spacecraft, then give preference to soothing color scheme. Due to this, by the way, your little vestibule will gain additional volume. Use a mirror, it will make the space of a complex and multifaceted due to multiple reflections. The mirror can be used in different ways. This may be hinged mirror (incidentally, a remarkable effect give a mirror maze, located opposite each other). 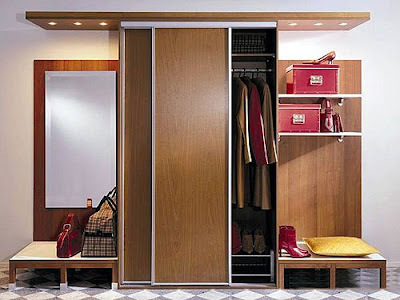 You can make a mirrored door with your wardrobe, and to make it easier to keep it clean, make a combined facade. 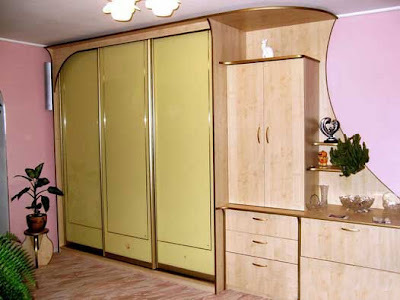 For example, use a combination of mirrors and frosted glass, or mirrors and veneers or any other, according to today's variety of finishes you will not be difficult to choose suitable. The mirror can also be a floor. His undoubted plus - in mobility. His undoubted minus - in the same mobility. Is it easy to move to a new place so easily it can be figuratively speaking "stesti. If you have small children or pets, you should choose a safer option mounting mirrors to avoid unpleasant consequences. Important is competently made lightning, because few who can boast of having the windows in the hallway. Although, perhaps, it would only create additional difficulties. 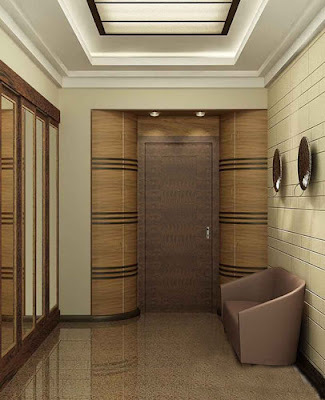 If you have a long hallway, pay attention to the various sconces, lanterns and other small lamps, which can be arranged in a row under the ceiling at a distance from each other. So you will get an excellent picture effect. Furnished his small anteroom, pay particular attention to the compatibility of the color and style of selected items. And if you're using a contrasting color, you must make sure that he is somewhere repeated, so your interior will gain sophistication and aesthetics. Pay close attention to exactly the hallway, equip her with love, as if it is just as important building, like any other in your home. And then you notice how much nicer you will return home, because it is a lobby greets you first.